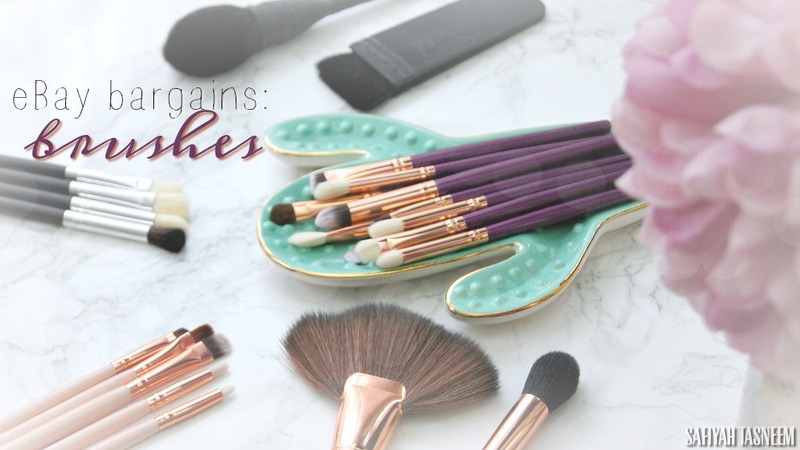 Over the years of being into makeup and blogging, I find it amazing how trends change and would never have guessed even 5 years ago that red toned makeup palettes would be a thing as most people were scared to wear it around the eye area for fear of looking like you had some sort of eye irritation/infection! Back when I worked for Urban Decay, there were probably maximum two pink/red shades that were rarely sold because of the fear of red and I remember telling customers to explore by adding depth to a look - by using a red or pink lightly above the crease if they wanted to try something new. Fast forward to 2016/17 and warm/red toned palettes are so hot right now we can't seem to get enough as it's wearable all year round but especially for Summer and Autumn/Fall. 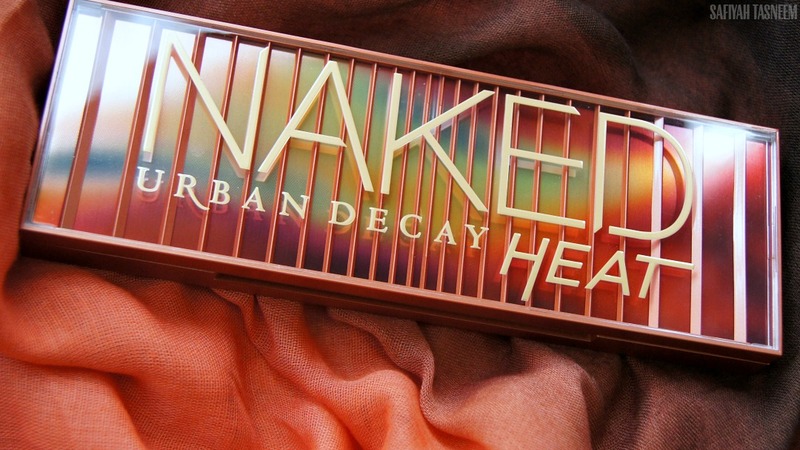 I missed the flash preview sale of the UK Urban Decay website of this Naked Heat palette and vowed to make a beeline to the store as soon as it was released to add it to my Naked palette collection. Then Urban Decay ever so kindly sent me this palette before the release date this week and I was positively grinning from ear to ear and knew I needed to swatch, wear and review it asap and I've literally been wearing different looks every day with this palette to test it out since receiving it. Read on to see my thoughts on this new addition to the Naked palettes..
Packaging: First of all the outer cardboard packaging is a slide out design, much like a matchbox and on the inside of the cardboard packaging is an actual print of matches in burning order, which is pretty cool and as you know I'm a sucker for attention to detail and themes like this. 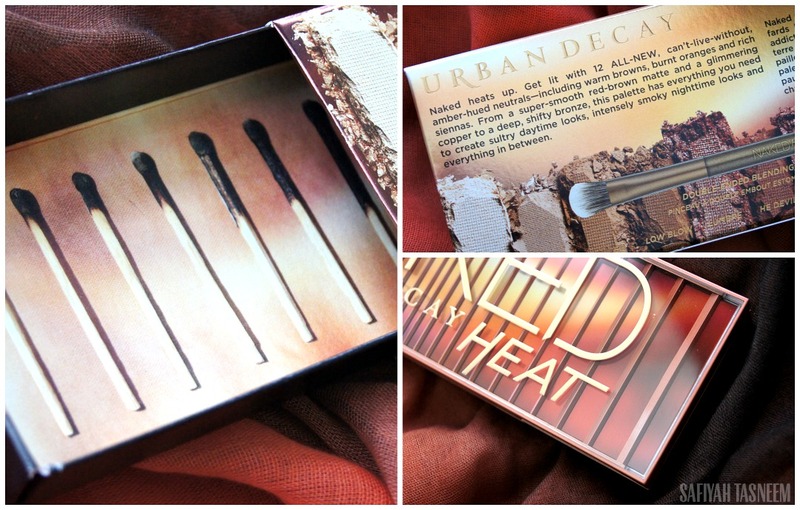 The actual case of the Naked Heat is along the lines of the Naked Smoky palette (review here), a squared off sturdy plastic case, with a firm magnetic closure and full size mirror in the lid. 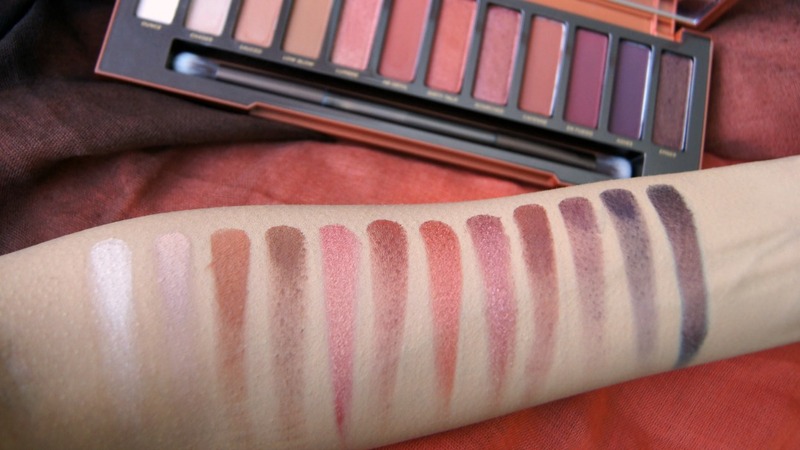 The colours in this palette are sooo on trend and hot (literally); despite there being warm toned palettes like my fave ABH Modern Renaissance and Huda's palette too, I still was super excited about this release because a) I'm an UD Junkie, b) I needed to add it to my Naked collection and c) it just looked like it would be the most flattering out of all the Naked palettes for warm to dark skintones. 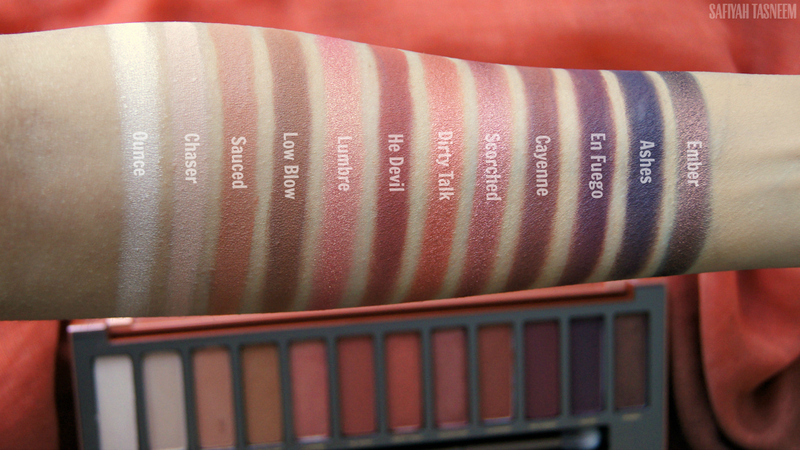 There's a good mix of mattes and shimmers: 7 mattes and 5 shimmers. 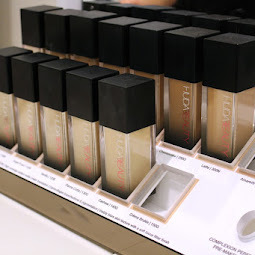 The ones that caught my eye were Chaser, Sauced and Low Blow; all perfect for creating a gradient crease blend on a skintone like mine (Chaser being like a matte skin colour that I always look for in a palette). If Chaser hadn't been in this palette, I wouldn't consider it a contender for competing against my ABH MR palette (where I use Golden Ochre as my skin colour/blending shade). 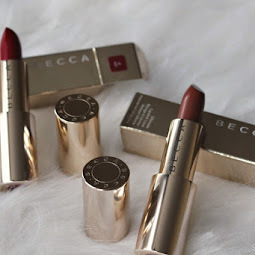 Ember is a beautiful copper-burgundy colour I can so see myself regularly using for a quick soft smokey eye and the reddy shades in the middle of the palette are the on trend kind of colours that work well to build intensity of a warm reddy look. I find that this palette is of medium to high pigmentation but as I've said before in the Naked Ultimate Basics review (here), not as consistent or buttery/thick as shadows from the original Naked palette and other earlier palettes. There's not much noticeable fall out/crumbling compared to more glittery/super soft eyeshadows. There was a lot of scepticism about this palette's pigmentation so I decided to swatch full "proper" swatches (above) so you can see the true colours of the shadows, as well as single swipe swatches so you can see the pigmentation of each shadow. You don't need to dig your fingers in these too much to draw some pigment, they are more pigmented than the shadows in the Naked Smoky, however En Fuego needed a good couple swipes to get to the same level as the others in my particular palette. Here's a list of shadows with the best and least payoff; the rest were dry/workable. Basically, the shimmer shadows are the most pigmented and the mattes were drier (as usual with most palettes these days). Chaser and Low Blow, despite being matte are less drier/more creamier mattes than En Fuego and Ashes at the other end of the palette, which are pretty dry as you can see from the single swipe swatches. Priced at £39.50 for 12 eyeshadows, each shadow works out to be £3.29; the price of Naked palettes has steadily gone up but it's still cheaper than the ABH Modern Renaissance palette. As I said above, this palette is great generally for all skintones who like to wear warm Autumnal colours, but especially for warm to dark skintones; I think fairer skintones may struggle to blend out the shadows with a transition shade as Chaser is just about my skintone (NC30/35), so would be more of a light browny crease colour for those with fair skin. 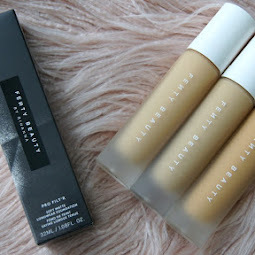 • pigmentation/dryness of the mattes on the right end, which can be remedied by using a good primer like the Eden primer potion or paintpot, and also using natural bristle brushes like in my eBay brush set find, or MAC 217/224 type brushes. • that there isn't a darker shade than Ashes to add even more depth for more smokier warm looks. I give this palette a rating of 4 out of 5! 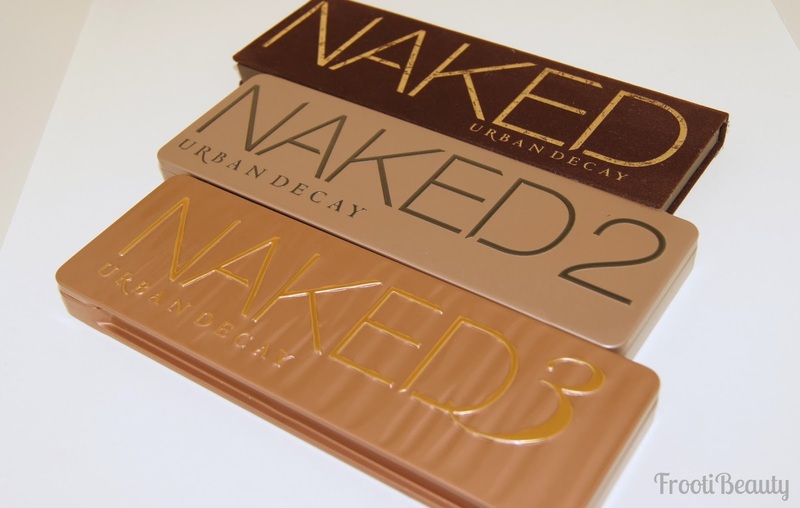 I've now updated my Guide to Naked Palettes post (which is also permanently on the side bar), so I hope you find it helpful for future reference. I'll be posting a makeup look (or two) very soon with this palette so stay tuned! Did you get this palette already or will you be? Let me know your thoughts below! Interesting and honest post as always! I really liked Ashes the most but disappointed ti hear it didnt swatch as well as some of the others! I also love the look of chaser! Such a pretty skin shade. I havent bought it and am still undecided! Ahhh I'm going to use it in a makeup look and tag you.. with the right natural bristle brush, it's still pigmented and workable thankfully! 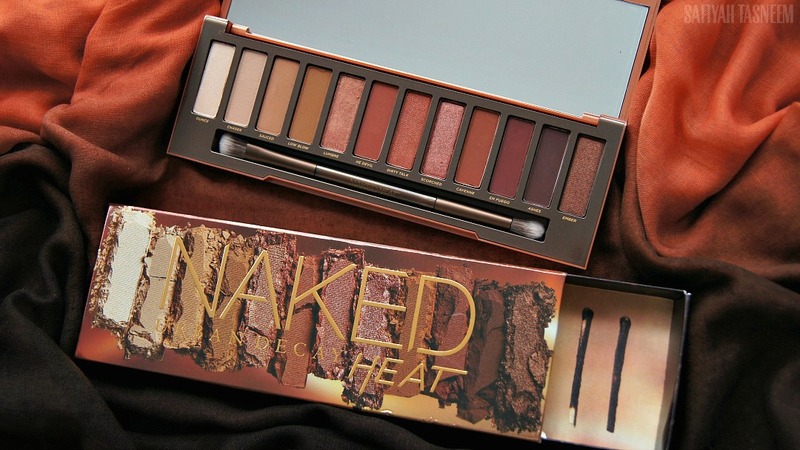 This palette is so stunning and brown girl friendly! <3 I love the aspect of it being appropriate for both summer and fall! ahh I saw when you got it and was like.. dammit why do I have to be a sensible mum! These are my type of colours. I need this palette in my life.